By all outward appearances, Christoffer Friend ’16 seems like many other successful seniors graduating from William & Mary this May. Double majoring in business analytics and economics, Friend has built on his undergraduate work with Tribe Athletics’ marketing and sports information departments to land a one-year position with the Kansas City Chiefs before returning to William & Mary to earn his master’s in business analytics. “The growth of business analytics is expected to be really big in the next 10 years, so I hopefully have a lot to look forward to,” Friend said. But unlike most graduates, Friend saved a person’s life this year. 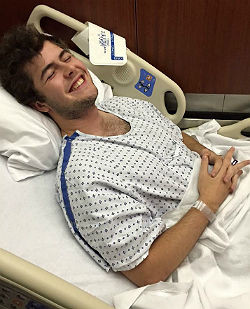 This past January, Friend anonymously donated one of his kidneys to a total stranger in need of a transplant. The story leading up to Friend’s January donation goes all the way back to an ordinary evening in the Bryan Complex during his sophomore year. And explore it he did. Friend spent the summer between his sophomore and junior researching the donation process, but had to suspend temporarily his efforts during his junior fall semester while he studied abroad through the Semester at Sea program. In winter break of his junior year, Friend contacted the National Kidney Registry, which put him in contact with the Henrico Doctor’s Hospital and the Virginia Transplant Center there. “Throughout spring of junior year and fall of senior year, I was working with them,” Friend said, recalling the numerous medical examinations and counseling sessions that were part of the donation process. “I essentially got a half-a-million dollar check-up for free,” he said with a grin. Friend checked into Henrico Doctor’s Hospital on the evening of Jan. 3, the night before surgery. Even as the surgery approached, Friend said that his nerves never got the better of him — the tonsillitis was far worse. Even with this extra complication, Friend’s recovery was smooth. Six weeks after the surgery, Friend received the green light to return to life as normal. He was able to return to his positions with Tribe Athletics and even participated in intramural volleyball and soccer. Throughout the entire process, Friend’s family remained steadfast and supportive. “My parents were supportive, but they were obviously nervous. I think the classic parent response — they were proud I was doing this, but it is surgery, and my mom and dad were both nervous but none of them had any objections. My sister loved it; I got great support from my siblings as well,” he said. Friend, however, made a point of not talking about the donation even to his close friends because to him, the donation process was never about him.